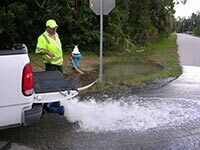 One of the primary goals of the Water Operations Division is to protect the public health of its customers. The water quality monitoring program is based on the requirements of the United States Environmental Protection Agency’s National Primary and Secondary Drinking Water Regulations. 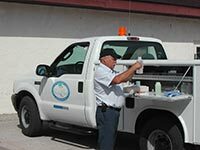 The Water Quality Division’s staff performs a wide range of duties such as bacteriological sample collection at representative points in the distribution system, perform routine chlorine residual inspections, administer the Lead and Copper program, maintain fire hydrants, respond to customer concerns, and make evaluations on the overall quality of the drinking water within the system. For more information, please read our Water FAQs. 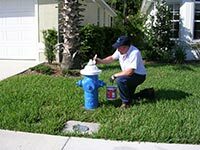 Periodically flush hydrants to maintain good quality water in the system. Train customers to collect first draw samples. 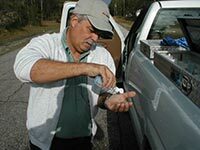 Perform additional special water quality samples related to the prevention of Lead & Copper development. Collect samples at remote locations and test for chlorine residual. Collect bacteriological samples and preserve them for the laboratory. Maintain positive pressure at all times to all customers. Respond to customer concerns and issues.